With the 2010 U.S. Open Golf Tournament beginning today, visitors from around the world have begun to arrive in Pebble Beach and Carmel-by-the-Sea. The dramatic beaches and sand dunes, the beauty of the Del Monte Forest, and the mysterious coastal Cypress trees continue to draw both tourists and artists to the area year round. One of the most prominent early Carmel artists, Mary DeNeale Morgan (1868 – 1948), made her home in the quaint village of Carmel beginning in 1910, when she settled there, until her death at 80 years of age on October 10th, 1948. 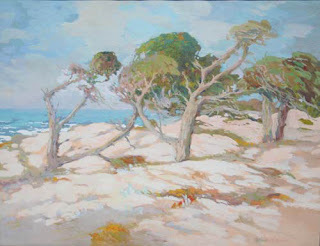 Mary DeNeale Morgan is best known for her pastels, watercolors, and oil paintings depicting the coastline, dunes, and beaches of the Carmel region. Her landscapes featuring the swaying, windswept Cypress Trees are sought after by knowledgeable art collectors, and enjoyed by the many museum visitors who appreciate this talented artist’s work. Born in San Francisco in 1868, Mary DeNeale Morgan moved across the Bay to Oakland as a young child. She was, for a brief time, a teacher at Oakland High School. 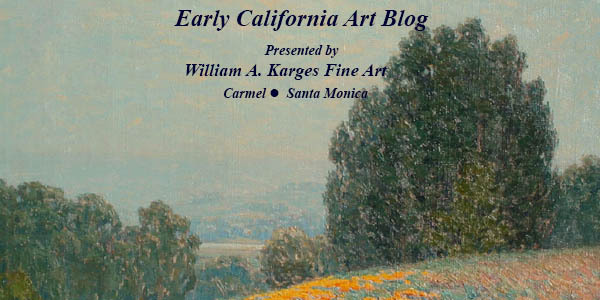 A longtime favorite student of the brilliant landscape artist William Keith (1838 – 1911) , Mary studied at the School of Design in San Francisco under several notable teachers, including Arthur Mathews, prior to her move to Carmel. She worked in her home/studio in Carmel, which she acquired from the artist Sydney Yard, from 1904 onwards. 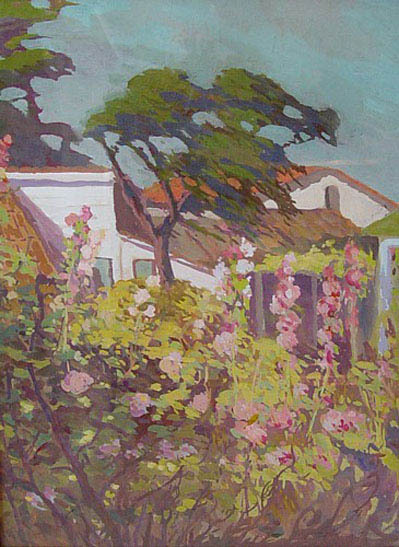 "The Artist’s Studio-Home on Lincoln near 7th Street in Carmel"
Mary was not only a well respected Carmel painter, but was an important part of the local art community. As a teacher and an organizer, she was instrumental in turning Carmel-by-the Sea into a vibrant art center. She was an early member of the Carmel Art Association, a group of local artists that included such famous members as Armin Hansen, E. Charlton Fortune, and master seascape painter William Ritschel. She was a student, attending William Merritt Chase’s summer classes in 1914, and eventually became a teacher, offering six weeks of instruction for $15 through the Arts and Crafts Club in Carmel. From 1917 to 1925 she was the Director of the Carmel School of art. Her paintings were also exhibited by the Del Monte Art Gallery and the California Watercolor Society. 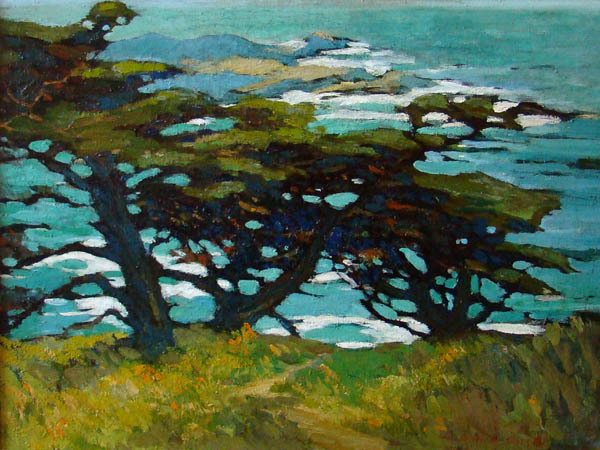 Her beautiful, contemplative, elegant landscapes of the Monterey Peninsula can be found in numerous museums including the Monterey Museum of Art , the Los Angeles County Museum of Art, and the Oakland Museum of California. 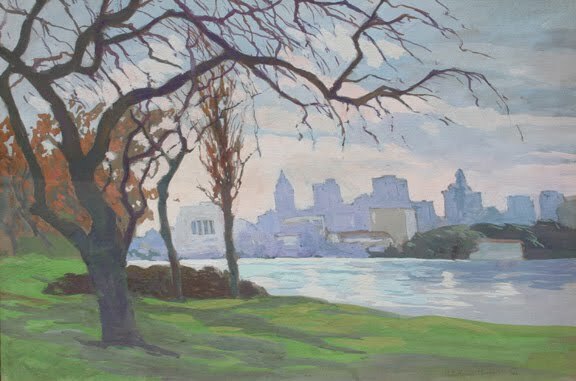 For additional information about available paintings by Mary DeNeale Morgan shown here, please feel free to contact us at (800) 833-9185 or (831) 625-4226 at our gallery in Carmel. Please stop by and visit the gallery this week at Dolores Street and Sixth Avenue if you’re in town to enjoy the U.S. Open in nearby Pebble Beach. One easy way to decorate a nursery is to use an image from art history. Many western painters have painted for children, such as this painting, by English artists Stanley Spencer, http://EN.WahooArt.com/A55A04/w.nsf/OPRA/BRUE-8LT7RP , should look good on the nursery wall. It's available as a canvas print of any size to be delivered to your home, from wahooart.com. It's affordable too.